The chairman of the House National Security Subcommittee is calling on the Department of Justice to launch a formal investigation into former FBI Director James Comey's alleged leak of classified information, according to an exclusive interview with the Washington Free Beacon in which the lawmaker also called on the Trump administration to purge all former Obama administration holdovers from government. Rep. Ron DeSantis (R., Fla.), a member of the House Committee on Oversight and Government Reform and chair of its National Security subcommittee, is urging Attorney General Jeff Sessions to launch a full scale investigation into Comey's handling of a series of potentially classified memos that were leaked to the press earlier this year. 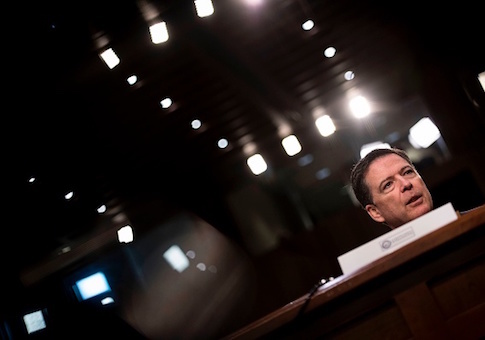 Comey admitted in testimony before Congress that he leaked these memos in order to spur an investigation into the Trump administration's alleged collusion with Russia during the 2016 campaign. Reports alleging these memos contained classified information has riled congressional Republicans and spurred new calls for an investigation into Comey. DeSantis also called on the Trump administration to purge all former Obama administration officials still working in the government, claiming that the holdovers and their allies outside the White House are responsible for an unprecedented series of national security leaks aimed at damaging the Trump administration's national security apparatus. DeSantis named Ben Rhodes—the former National Security Council official responsible for creating an in-house "echo chamber" meant to mislead reporters and the public about the landmark nuclear deal with Iran—as a primary source of these leaks and urged the House Intelligence Committee to call Rhodes and other former Obama officials to testify publicly about any role they may be playing in spreading classified information to reporters. Comey's behavior warrants a DOJ investigation due to the former FBI director's admittance that he disclosed private information to the public in order to damage the Trump administration, according to DeSantis. "Congress needs to press Sessions and other people to make sure they are investigating this because the American people need the truth," DeSantis told the Free Beacon in a wide-ranging interview. "If he did violate any laws, he needs to be held accountable. If you're violating laws in service of doing political warfare, that is just absolutely unacceptable, particularly for someone who held such a high position in the government." Comey has gone on record stating that he "leaked in order to trigger a special counsel, which in some ways is pretty extraordinary," DeSantis noted. Comey's actions raise further questions about his ethics, DeSantis said. "Not only is he leaking this stuff, not only were the memos done in the course of his employment and likely government property, he may have disclosed classified information in this quest to basically wage a vendetta against the president because the president fired him and to try and create a special counsel," DeSantis said. "This guy is really a creature of the swamp. He maneuvers around D.C. in ways that are very similar to how D.C. insiders operate," DeSantis said of Comey. "He's one of the best in those regards." DeSantis and other lawmakers are now seeking copies of Comey's complete memos in order to review whether classified information may have been leaked to the press in violation of U.S. law. "Comey has made a concerted effort to not disclose these memos," DeSantis revealed. "I think Congress obviously has a right to get them." Comey's actions are only one part of a wider national security scandal in which former Obama administration officials and their allies still in government are leaking classified national security information in order to undermine the Trump administration and handicap its national security apparatus, according to DeSantis. "This is not just standard Washington fair," DeSantis said. "It's happening on such a scale with this president that it's much different." "Really, it has a whiff of people inside the bureaucracy who do not accept the election results, so they're rebelling against the elected president by leaking and doing things to damage him politically," the lawmaker explained. "It's unprecedented, certainly in modern American history. The way you stop the leaks is if people are leaking info that is classified, and that's a crime, DOJ has got to pursue that." "If the bureaucracy is going to weaponize this stuff, I think Congress is going to be much less willing to give them the authority to do this," DeSantis said. "It is a big deal, and if no one is held accountable it's going to continue to happen." DeSantis also expressed confusion at the Trump administration's continued unwillingness to fire Obama administration holdovers and fill the government with officials who are more willing to implement the White House's vision. "Any Obama holdover at any of these agencies, you've got to get them out of there because clearly they're not on the same team and particularly on the [White House] National Security Council," DeSantis said. "I think Congress and some members on the Intelligence Committee can call Ben Rhodes to testify," DeSantis said. "He may be able to invoke executive privilege from when Obama was president, but he definitely can't do that in any interactions he's had since then." DeSantis identified Rhodes and other senior Obama administration officials as being "involved with feeding journalists some of these [leaks]. I believe he's in touch with people on the National Security Council. It would be absolutely legitimate as part of leak investigation to bring him in and put him under oath, and I would absolutely support doing that." "The press has helped facilitate this breakdown," he said. "They run stories that say former officials say, and basically that means Obama people are saying it. A lot of times these are people who are not even in the government anymore and the media will take stuff and run with it and a lot of times it's not fully the truth." "In the zeal to get Trump on something, they rely almost entirely on people that aren't willing to raise their hand and testify under oath or name themselves," DeSantis said, adding that, "Republicans don't trust any of these newspapers." This entry was posted in Politics and tagged Ben Rhodes, Obama Administration, Ron DeSantis, Trump Administration. Bookmark the permalink.